How could a simple question during a routine workshop become such a game-changer? And modesty aside, I was on my game. I had effectively made the case for cleaner, less-cluttered slides, impressed upon the 30+ in attendance that presentation design is not just about making pretty slides, advocated for the use of appropriate animation as a storytelling device, and geeked out with several PowerPoint techniques that they clearly had never seen before. I did all of this while taking questions at every turn, weaving before-and-after examples of Micron slides into each topic and while modeling various principles of presentation technique. By 3:00p, this was a very good day in the making. We invested about five minutes in a debate about which type was better suited for presentation projects, but that became an immediate quagmire. You simply cannot tell a long writer that he needs to start outlining any more than you could tell an outliner that she needs to start thinking in paragraphs. With apologies to every book author who has advocated for creating outlines to formulate thoughts, that is foolish advice. You either have instincts for that or you don’t and trying to fight your instincts would be so much worse than anything else you might do right, you would never recover from it. You will take the traditional route of jotting down ideas and finding homes for them. You will compile main thoughts, developing sub-points, and watch the progression of ideas take shape. For many people and in many instances, sentences and paragraph get in the way; they tend to clutter your brain. 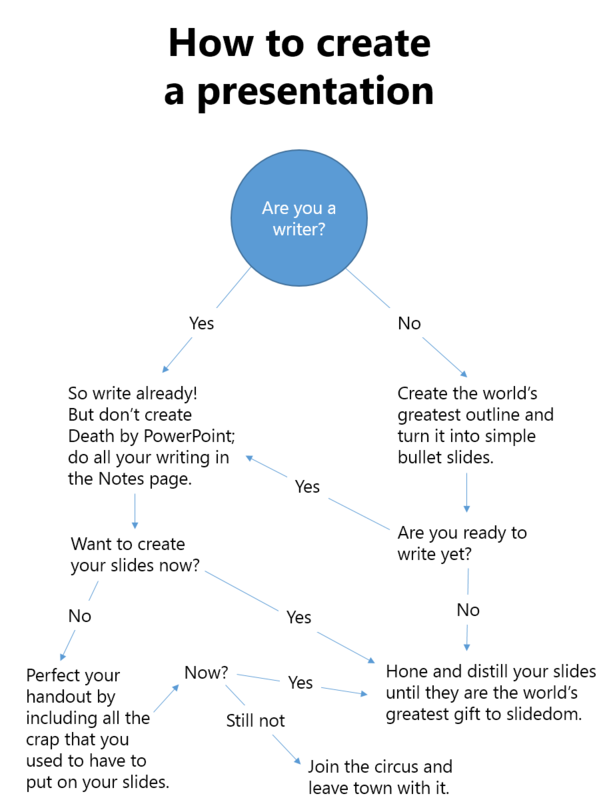 You’ll worry about the actual words later–right now, you just want to capture ideas. Your brain is in total free-form mode and you completely indulge it with PowerPoint’s titles and levels of bullets. If you are most comfortable formulating your thoughts by writing in sentence and paragraph form, then by all means go right ahead. Put your hands on your keyboard and start banging out brilliance. As a writer, I know first-hand the thrill of getting into a creative groove during the process of fully-formed composition. I can get in that zone much more easily if I allow my thoughts to become sentences. If you’re like me, don’t let anyone tell you to start with bullet points. Don’t do it! You want to open your creative canal as wide as possible, and to do that, you write. You’re a writer; that’s what you do! So Elizabeth, I’m ready to answer your question now. A good presentation is made up of three things: what you say, what you show, and what you give. Your quest is to make each of them as good as you possibly can. In order to do this, however, you must turn off your auto-pilot, because if left unchecked, it would take you down a dreadful spiral. That’s the spiral where you try to create some awkward mixture on your slide between the stuff you want to say and the junk you need to print. With all of that prose staring at you, you are likely to read your slides verbatim, and now those three tenets–say, show, and give–all become the same thing. Interesting discussion Rick. Giving people options like you have seems a good (and realistic) way to go. As you mention, presenting and presenters are such diverse beasts, so flexibility’s a good thing! I’ve argued for something similar, but the two paths I suggest are to either write out your ideas in full, or record yourself rehearsing so you capture your flow that way. Would be interested in your thoughts on that suggestion. This is one the best posts I have ever read. I was always wandering if I was normal or not because i am more on the writer side than the outliner. But what you helped me realize is I really need to write the beginning and the end of my presentation and that I could outline the middle part. Thanks for that precious advice! Hopefully i will attend the conference in September.